Oh Zelda. Poor dear confused Zelda. Throughout the entire reading of Z: A Novel of Zelda Fitzgerald by Theresa Anne Fowler I had to keep reminding myself that this book was a novel - a well-researched novel no doubt, but still a novel. It is not a biography. The author is clear on that. It's right there in the subtitle. And yet, Z reads as much like a biography as any novel can. These are not made up names and unrecognizable characters. F. Scott Fitzgerald, whom we read only the month before, is the most obvious big name. But there's also the villainous Ernest Hemingway, the delightful bit player Cole Porter, and other notables of the jazz age. They are producing works of art we know - songs and short stories and novels. In the author's afterword she says there are two camps on the Fitzgeralds - one that says Zelda ruined Scott's life, and one that says Scott ruined Zelda's life. My reading of it was that they were some sort of terrible chemical reaction in which two elements are reduced to their worst parts, in this case madness and addiction. Although, how mad Zelda actually was is also up for debate, and addiction seemed to be the oeuvre of their circle. That Fowler manages to write her take on a possible life of the Fitzgeralds with wit and power while maintaining a relatively neutral tone (although she is very clear that she's camp Zelda, this Zelda is not without her flaws) is impressive. The story has the pacing, character development, and detailing of any great novel, with the biographical details that keep you having to remember - this is not reportage. Bits of the Fitzgerald's lives made it, apparently, into The Great Gatsby, and likewise bits of The Great Gatsby make it into Z which was really fun to experience back to back. I loved reading about creative people living creative (if often messy) lives. To have a community of artists, writers, musicians, and theatre/movie people all running in the same circles must have been extraordinary. I would love that kind of circle for myself. I found Z fascinating reading - whatever is real or unreal, it's a great story well told. It was bound to happen eventually. After 14 months this was the first book club meeting that I missed. I was in Ottawa doing training for my volunteer trip to Jamaica. Even sadder, the fabulous and hilarious hostess was hostess for the first time, and I missed it. As I read the novel on the plane I did imagined what the ladies would have thought - I bet the conversation was stimulating and fun and revealing. It always is. While I didn't get to attend the August meeting, the lovely ladies of book club did throw me the perfect going away dinner at a local Caribbean restaurant. Over rum punch and jerk meats we laughed, we consoled, we teased, and we generally made me realise how hard it would be to be out of that circle for five months. Okay, now that I have yet again begun a post by giving you the most horrendous of ear worms, let me get serious(ish) for a moment. I am not sailing away. 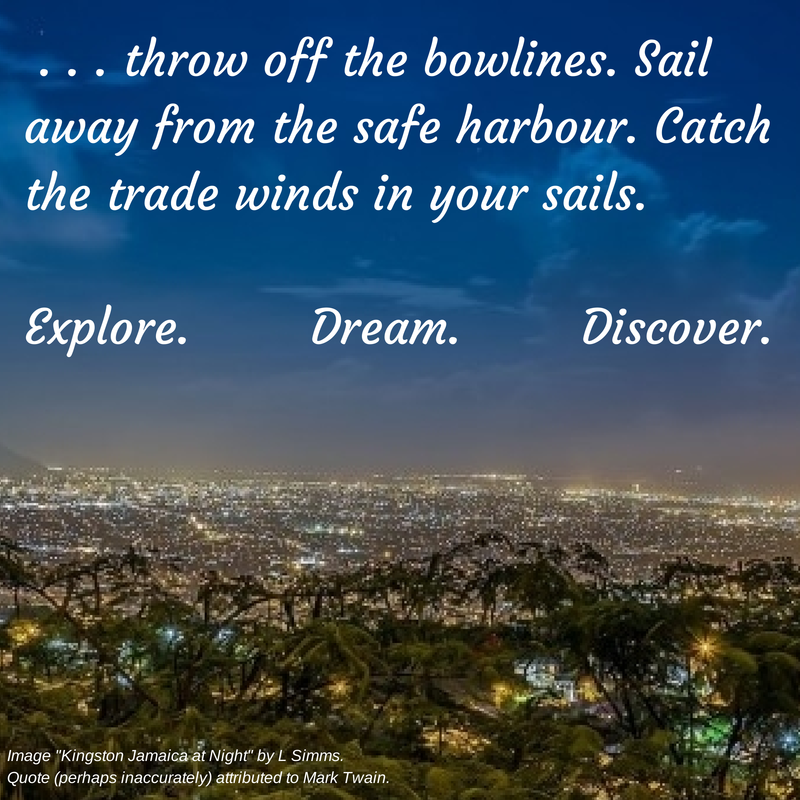 I am, however, flying away, and, in fact, taking the (apparently wrongly attributed) advice of Mark Twain and casting off the bowlines, exploring, dreaming and discovering. After a year of feeling stuck I am now bounding forward. In exactly one month I leave my safe harbour of Victoria BC for a new harbour of Kingston, Jamaica where I will be volunteering for six months. It's a startling adventure. There are moment when I think I may want to reconsider. And, as I promised my ladies at our book club retreat, I am Daring Greatly. It's something I have dreamt of doing for a lifetime. And something I'll be sharing about more fully elsewhere. This blog will continue to limp along, weighed down by navel gazing & book reviews, while my adventures with CUSO International will soon be shared on a new site. As a teenager in northern British Columbia I saw television ads for international aid agencies and was intrigued. In my family overseas service meant missions work, and I was fascinated to learn that people could share things beyond their faith – their knowledge, skill, ability and compassion – in the world. When I was 17 years old I traveled to southern Africa; that trip began my life-long yearning to travel, my interest in global justice, and my earliest development of cultural competency. That trip also birthed a dream that has grown as the years rolled by - the dream to make a real and lasting difference in the developing world. I studied. Raised my children. Gained experience, compassion and - I hope - wisdom. In all of that, the goal of using my skills and knowledge internationally called me forward. At this point in my life, with my sons grown and stable and a clear sense of myself and my abilities, it’s time to make that thirty year old dream come true. CUSO International is helping me do that. I have followed and supported CUSO for years, biding my time until my life aligned with their volunteer opportunities. The placement for a 6 month Marketing, Communication & Branding Advisor for a national organization in Kingston, Jamaica had that just right feel – not too far, not too long, a great introduction to international development. I can’t wait to go, to learn, to grow, to teach and to serve. In spite of the obstacles facing them, people in every corner of the developing world are building better futures for their communities, and thanks to CUSO I get to work with them! I will work side-by-side with these committed citizens to make positive change happen. Lasting change requires not just a financial investment, but also a human investment. That’s why Cuso International shares skills, and changes lives. While there are many volunteer-sending agencies, one of Cuso International’s unique attributes is its role as the North American strategic alliance partner of VSO, a worldwide partnership of Voluntary Service Overseas organizations. This is the world's largest non-governmental development network that works through volunteers. It allows them to recruit from all over the world, and to transfer the expertise, experience and ‘best practices’ of one country to another. Not everyone can work overseas, but everyone can support that work. Thank you for whatever you can give to support my work and to help me pay it forward to future CUSO volunteers.